The River Thames winds through London, and even on the dreariest day the bridges crossing from one bank to the other are beautiful and varied. I love crossing from end to end, often traveling from one very different neighborhood to another. 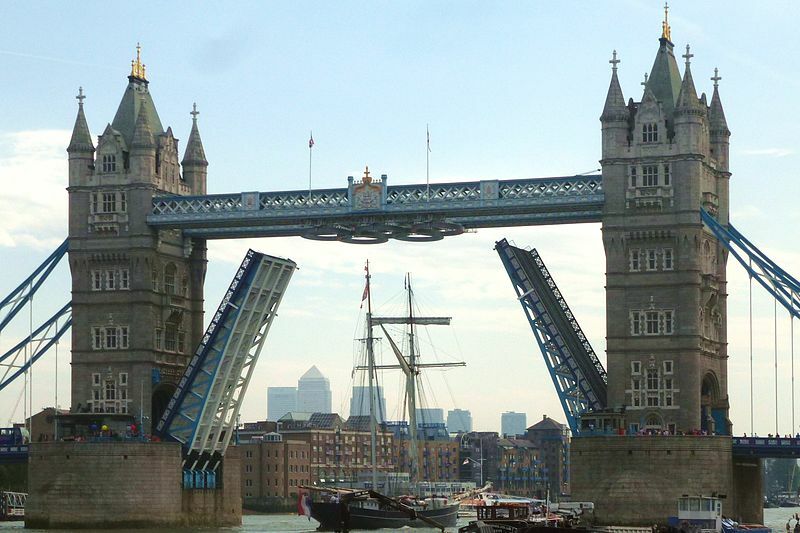 Tower Bridge is relatively young by London Bridge standards. It was opened in June 1894 after years of discussion and eight years of construction. 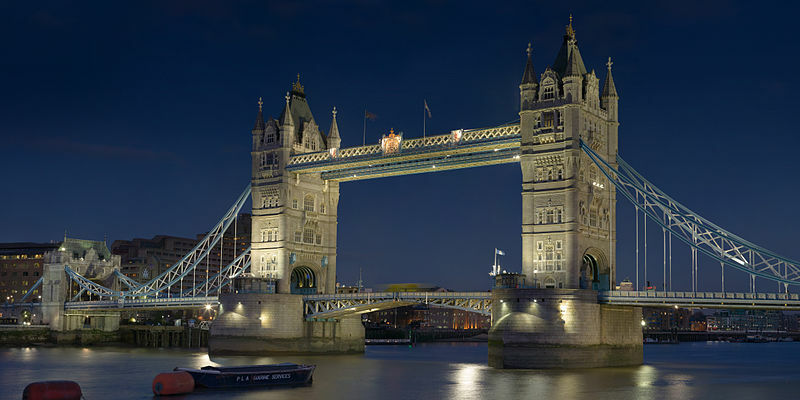 Tower Bridge is a combined bascule bridge (the word means see-saw or rocker in French) and suspension bridge. 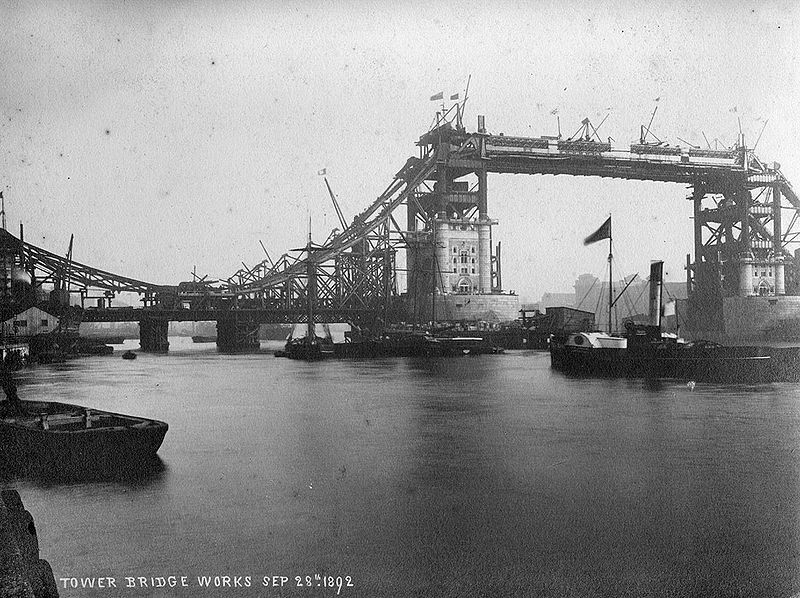 View of Tower Bridge construction works, September 28th, 1892. Photo is in public domain. This allows it to be raised quickly for passing ships. 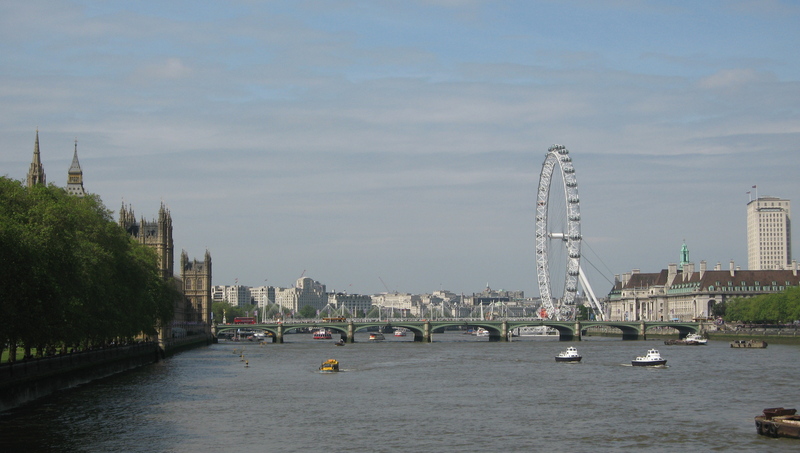 Visitors can walk across the high walkways and enjoy spectacular views of London, and it is close to The Tower of London, from which it takes its name. 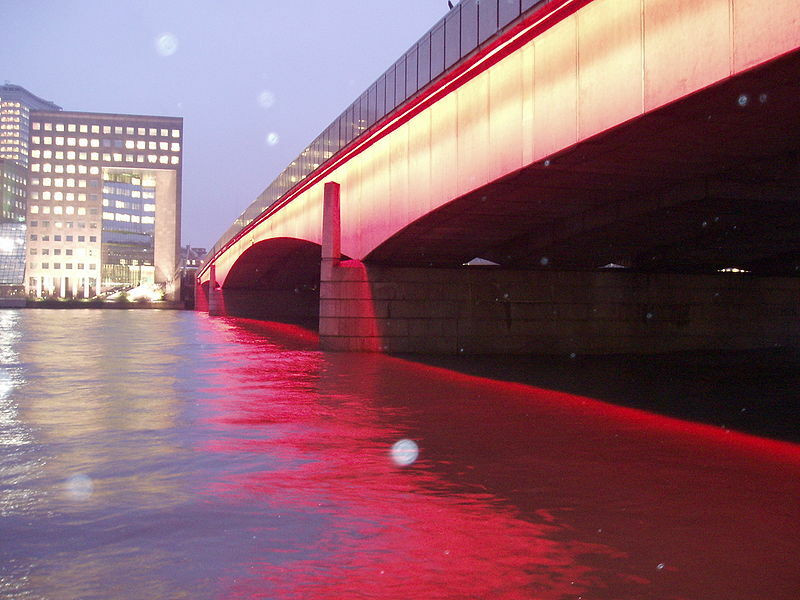 The bridge’s current color scheme of red white and blue dates from 1977 in honor of Queen Elizabeth II’s silver jubilee. Originally it was painted a greenish-blue color. The London Bridge, in one form or another, has existed on this spot for over 2000 years. The Romans were the first to put one up when they first came to London in 46 AD. Originally built of wood, the bridge was prone to falling down from fires, storms or invading armies. Thus the nursery song. The first stone bridge was constructed in 1209 when King John was on the throne, and he permitted houses and shops to be placed on the span which took 33 years to build. There was a drawbridge to allow ships traffic to pass, and gates at either end. Drawing of London Bridge from 1682 London Map. 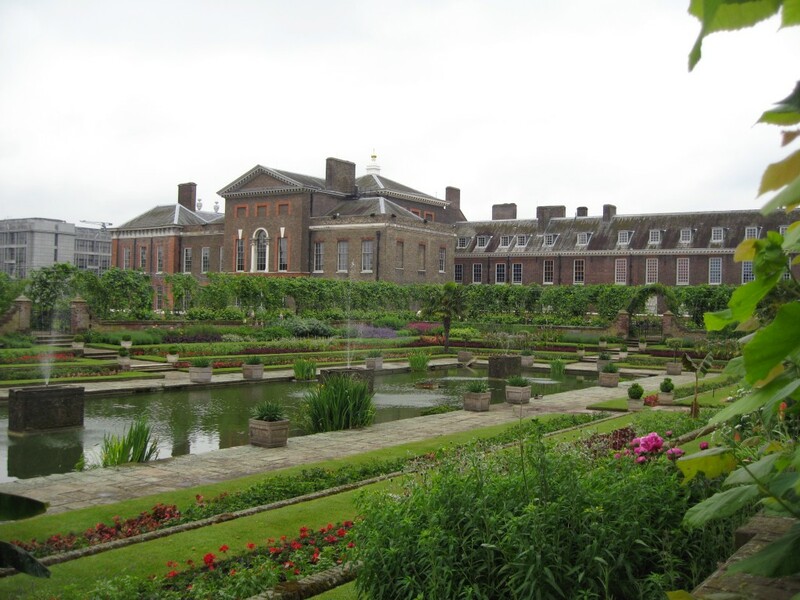 It lasted until 1831, and was replaced with a bridge that had foundation problems. The current London Bridge was opened by Queen Elizabeth II in 1973 and both vehicles and pedestrians now use the bridge. Originally called the Alexandria Bridge after the wife of King Edward VII when it was opened in 1866, the Cannon Street Station Bridge has taken on the name of the terminal station of the National Rail at the end of the bridge. 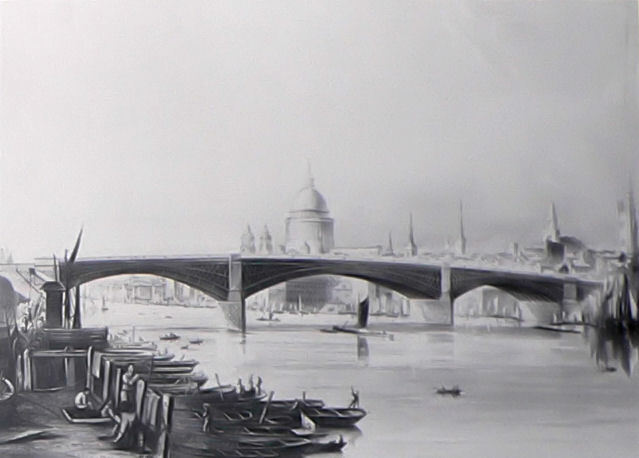 Cannon Street railway bridge. 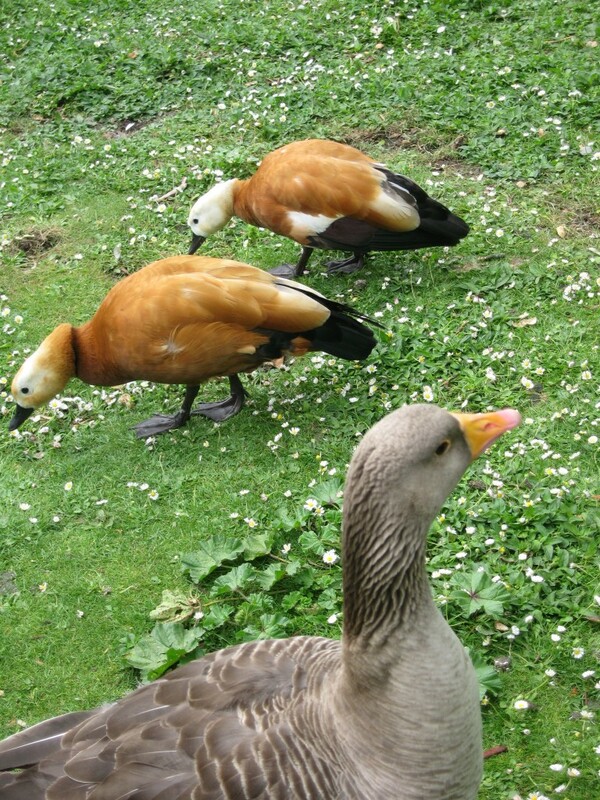 Photo taken by Will Fox 2005. Originally known as the Queen Street Bridge or “Iron Bridge”, it opened in 1819. It was demolished in 1913. Southwark Iron Bridge. Wikimedia Commons. The new arch bridge opened in 1921, having been delayed by WWI, linking Southwark and the city across the Rivers Thames. Southwark Bridge from the south bank of the Thames. Photo: released to public domain by Arpingstone. In the past, watermen would transport people from one side of the river to the other, and the stone steps to the water under the south side are still visible. It has the reputation for being the least used bridge in central London. The south end is near the Tate Modern. 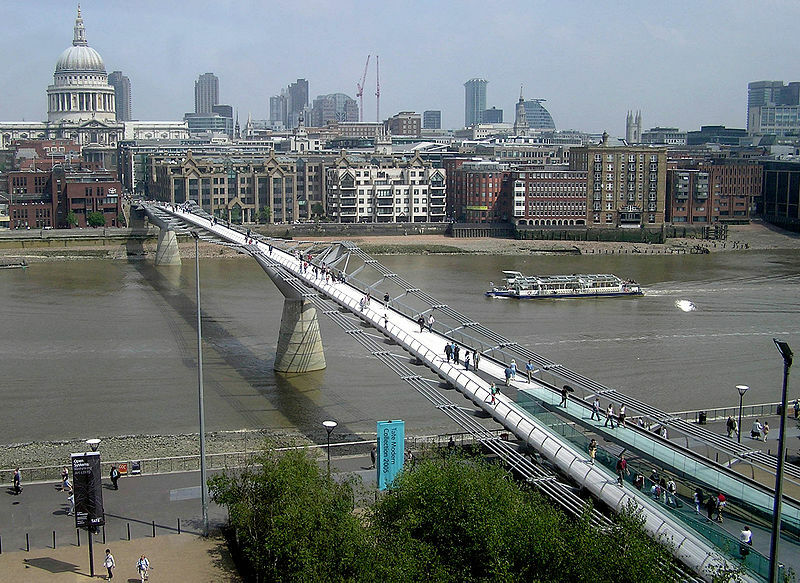 I love the Millennium Bridge–a pedestrian-only bridge that crosses over the river from St. Paul’s Cathedral to The Tate Modern Art Museum on Bank Side. 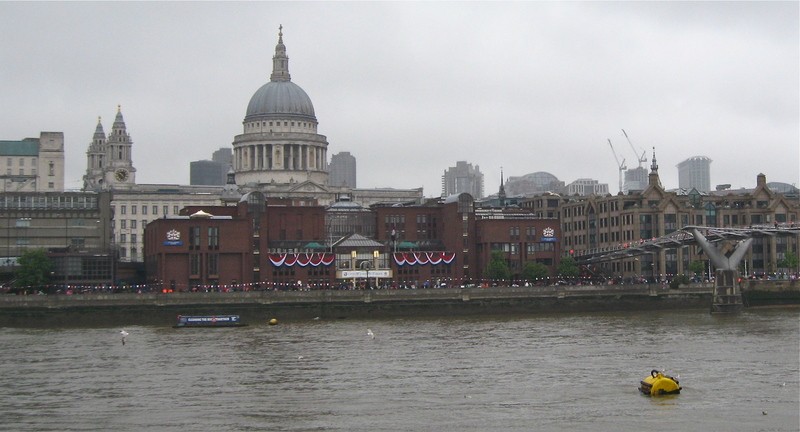 The Millennium Bridge on the right and St. Paul’s cathedral in the center on a grey English morning. Photo by me. It opened in 2000, but closed a few days later. There was a problem with a wobble, not something you want when crossing a river on foot. They had not counted on the effect of the many people walking across at the same time. A few million pounds, and a couple of years later and it re-opened. No wobble at all. 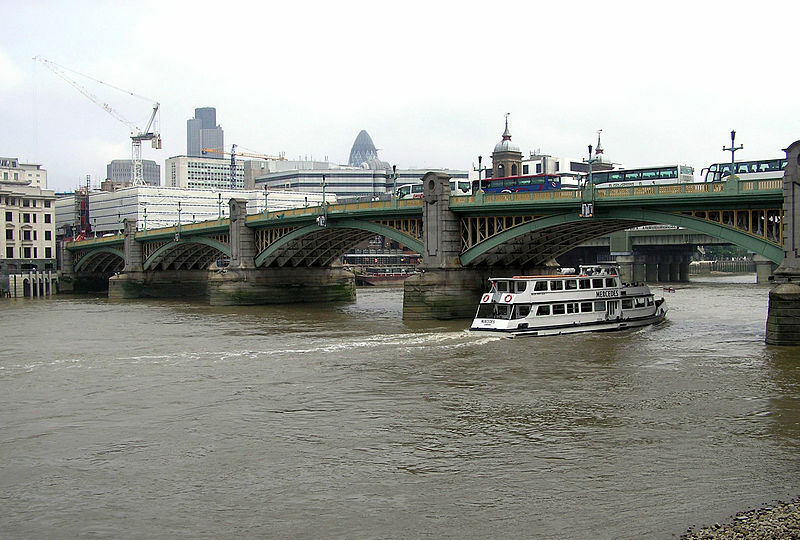 The Southern end of the bridge is near the Globe Theatre, the Bankside Gallery (home to the Royal Watercolour Society and the Royal Society of Painter Printmakers. and Tate Modern. The new bridge which opened in 1864 replaced a less strong bridge that had opened in 1864. The new bridge could handle the “modern” trains. It is named for Blackfriars’ Station. 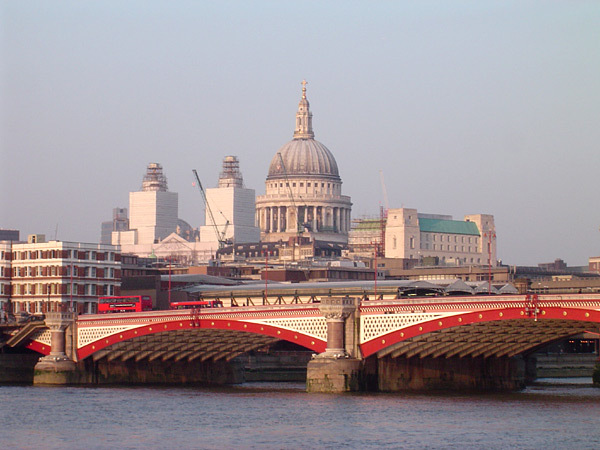 Blackfriars was named for a 13th century Dominican Monastery that had provided the name for that section of London near Ludgate Hill, and is both a vehicle and pedestrian bridge. The first bridge at this spot was opened in 1769 as a toll bridge, and was replaced by the current bridge which was opened by Queen Victoria in 1869. This bridge leads to the South Bank where you will find the Royal Festival Hall, Waterloo Station and the Royal National Theater. You can walk this one, or ride across. The first bridge on this site opened in 1817 as a toll bridge and is named for the Napoleonic War’s Battle of Waterloo. The current bridge was completed in 1945. 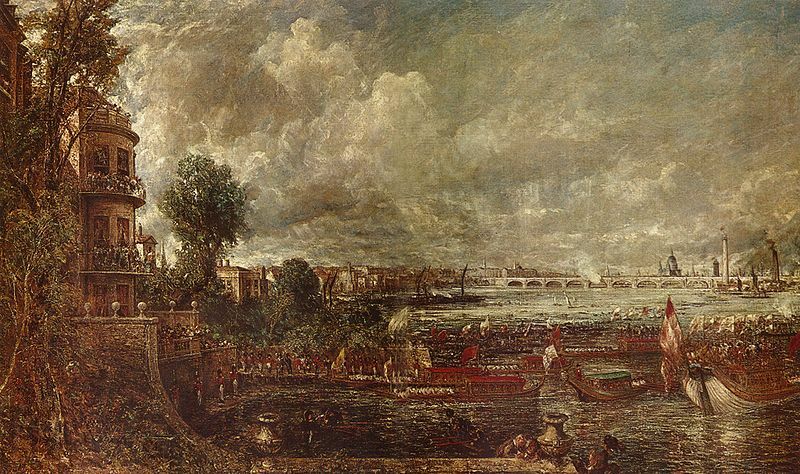 John Constable, View of the old Waterloo Bridge from Whitehall stairs, 1817. 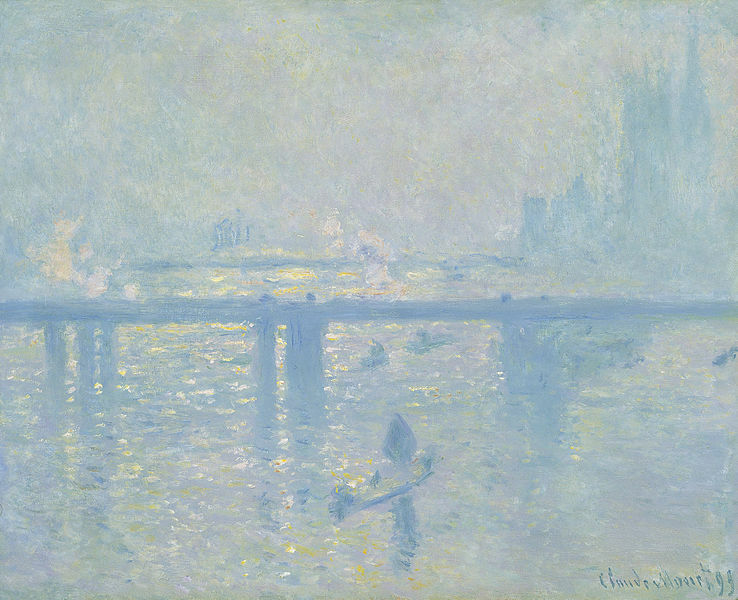 A railway bridge, sometimes known as the Charing Cross Bridge. The bridge is now a vehicle bridge bordered by two pedestrian walkways. 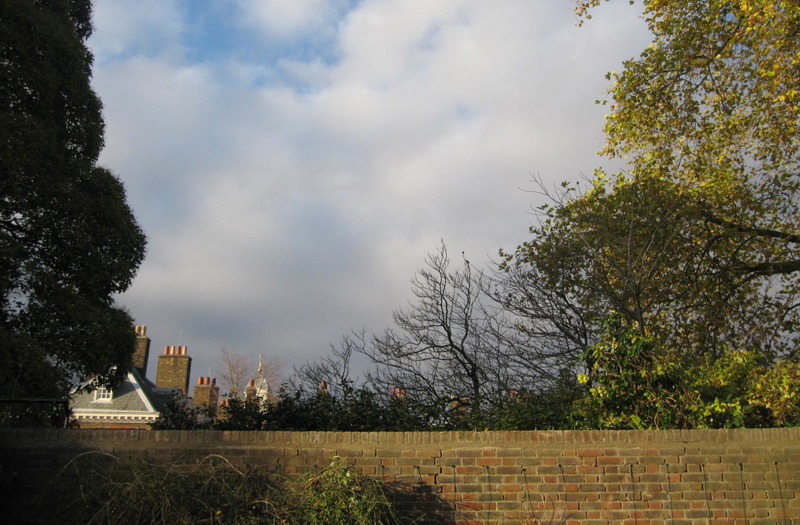 The first bridge on this site was a suspension foot bridge in 1845. Less than 20 years later it was replaced to accommodate the railroad. 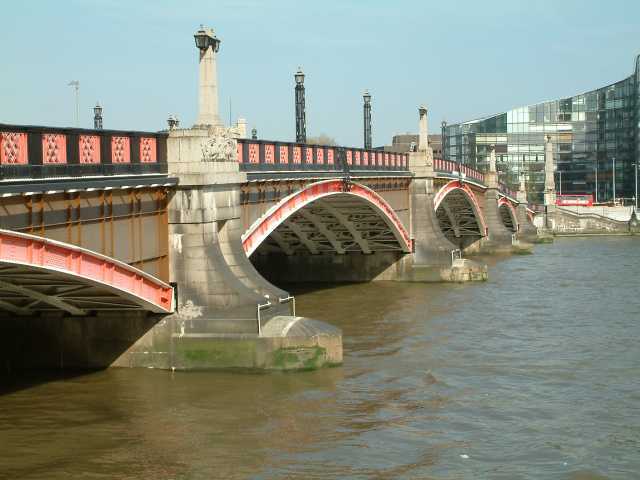 Made of wrought iron, the current bridge opened in 1862 and is London’s oldest bridge, connecting Westminster and Lambeth. Westminster Bridge. Photo by me. The Gothic Detail reflects the nearby Houses of Parliament and can handle both vehicles and pedestrians. The bridge is painted predominantly green, the same color as the leather seats in the House of Commons which is on the side of the Palace of the Westminster nearest the bridge. The next bridge is painted predominantly red for the House of Lords, in fair play since the Westminster is green for the House of Commons. Lambeth Bridge, London. Wikimedia Commons. The vehicle and pedestrian bridge was opened in 1932 by King George V. The bridge was used for the 2004 film Harry Potter and the Prisoner of Azkaban for a scene where the Knight Bus must pass between two Leyland Titans. The original bridge was built on the site of a former ferry between 1809 and 1816, and was the first iron bridge over the Thames. 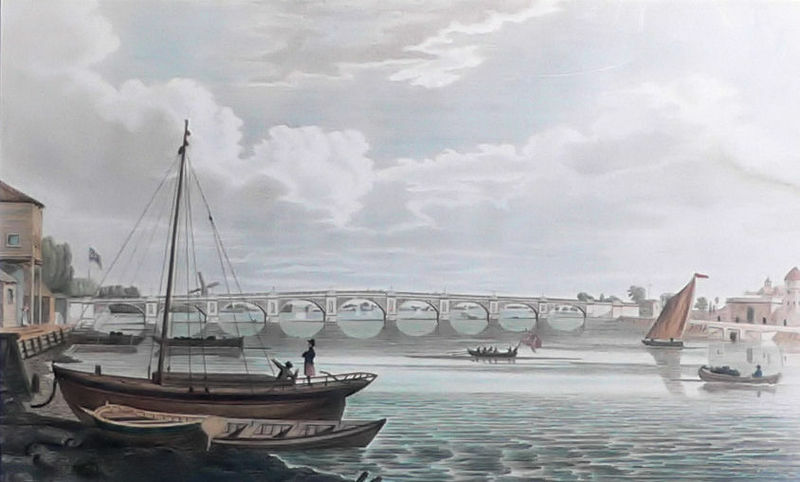 A view of James Walker’s Regent’s Bridge of 1816. Artist Unknown. 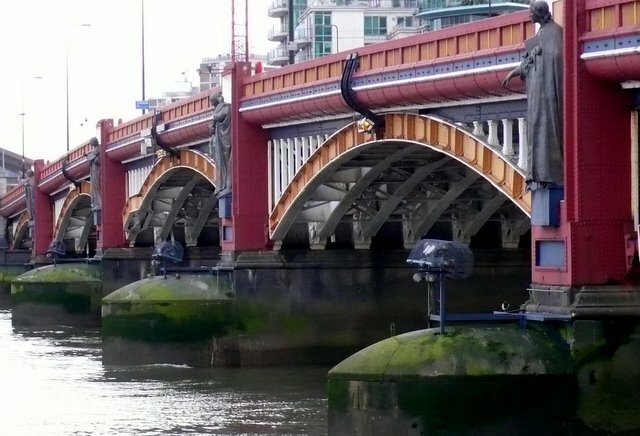 The current bridge, originally known as Regent Bridge, was opened in 1906, and now connects Vauxhall on the south bank and Pimlico on the north bank. The bridge carried electric trams until service ended in 1951. Originally known as Victoria Railway Bridge, Grosvenor Bridge is an arched railway bridge originally constructed in 1860. The bridge was rebuilt and widened again in the 1960s. 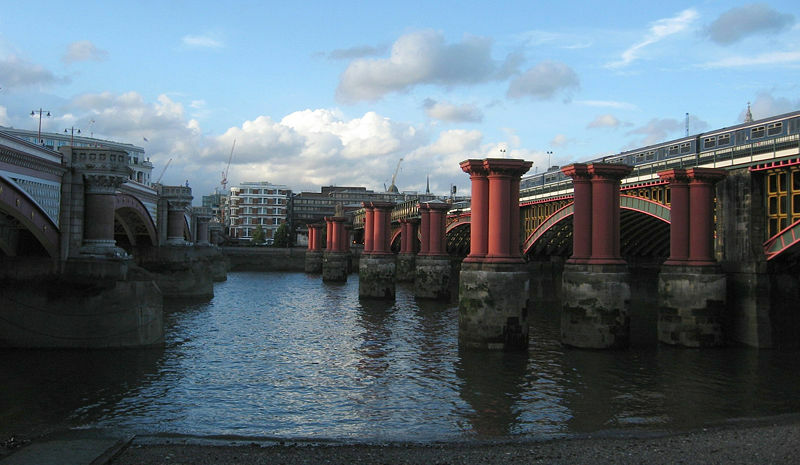 It was the first railway bridge across the Thames in central London, and carries trains into Victoria Station. On the South Bank is Nine Elms to the east and Battersea to the west. Chelsea Bridge in west London connects Chelsea on the north bank to Battersea on the south bank. There was a natural ford on the site, a shallow crossing of the Thames where you were able to cross by wading or in a vehicle. 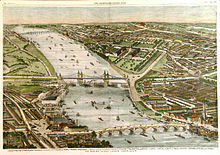 The first Chelsea Bridge did not open until 1857, and was built to provide convenient access to the new Battersea Park. The suspension Bridge was narrow and structurally unsound. Between 1934 and 1937 it was demolished and replaced by its current structure, the first self-anchored suspension bridge in Britain. 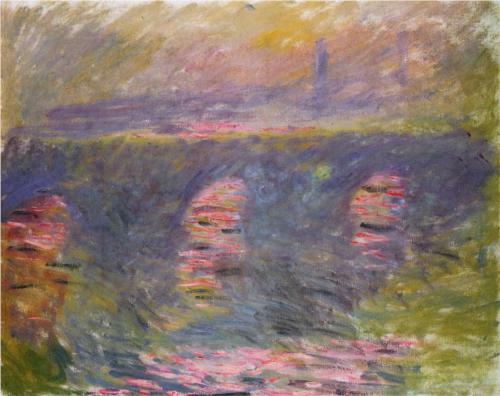 The bridge is floodlit from below during the hours of darkness. The towers and cables are illuminated by 936 feet of light-emitting diodes. 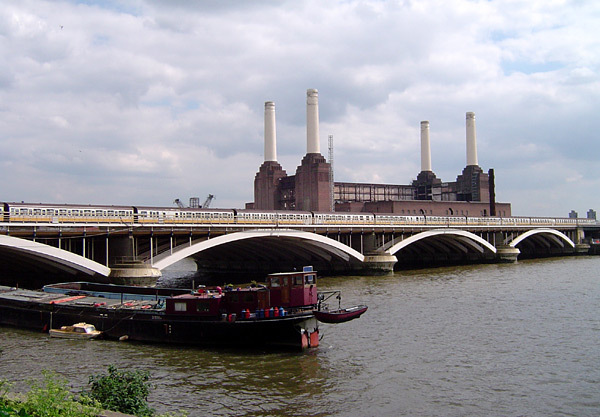 In 2004 a smaller bridge perpendicular to the main bridge Battersea Footbridge was opened beneath the southern span. 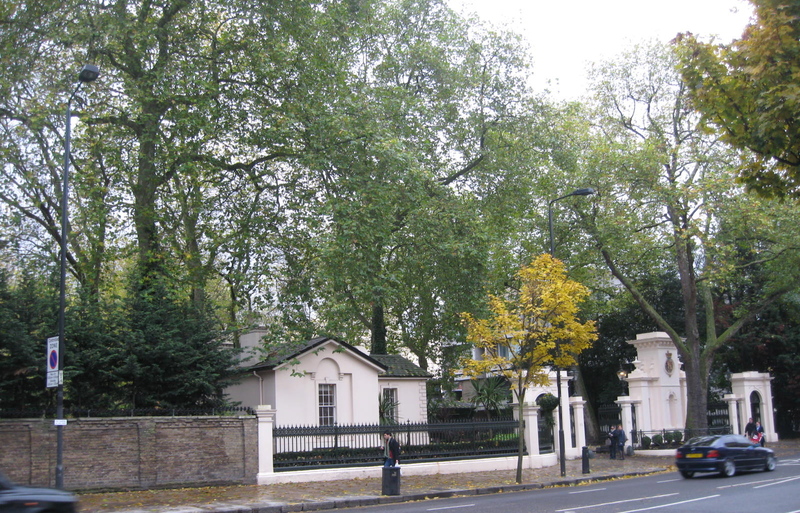 Who would have thought bridges could have such rich histories…only in London. For the first time in 60 years, the Royal Yacht Britannia’s interior state rooms’ sketches by architect Sir Hugh Casson have been handed over to a trust by his daughter, according to an article in the Daily Mail. To see all the glorious details in the article, click here! The yacht was used by Queen Elizabeth II and Prince Philip from 1953 until 1997, 44 years in service. 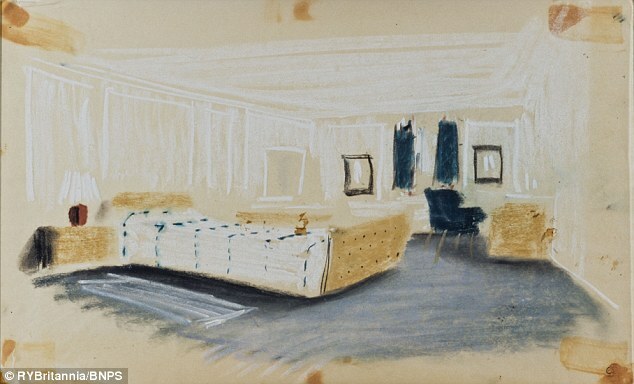 From the Daily Mail article, the original rendering of the Duke of Edinburgh’s stateroom on the Royal Yacht Britannia. We toured the yacht when we were in Scotland a few years ago, and it is magical. I could only dream of touring the empire on such a floating palace. It has been a long time coming this year, but summer is finally here. Even England is slowly getting warm. In honor of the occasion, I thought I’d share with you an image I took in London last June of some very happy residents of St. James’s Park. Happy summer to all. With the celebration of the Queen’s 60th Anniversary of her coronation this week, there is an opportunity to see some amazing portraits circulating. 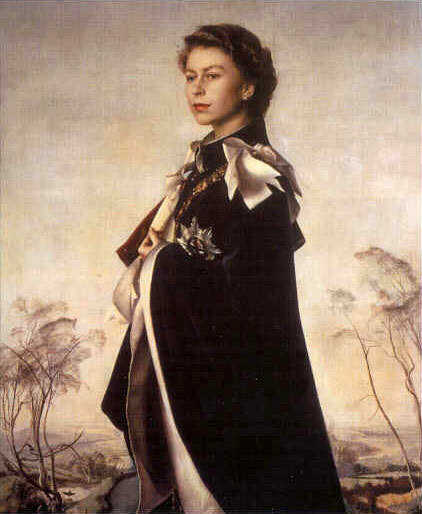 One that caught my attention is Study for the portrait ‘Her Majesty in Robes of the British Empire’ by Pietro Annigoni in 1969. © Royal Collection Trust/ © Her Majesty Queen Elizabeth II 2012. The study, done in oil distemper and pastel and measuring more than life-size at about 16 x 24″, was commissioned by the Trustees of the National Portrait Gallery. The Queen is wearing the red cloak of the British Empire. Fifteen years earlier, Annigoni had painted the young Queen for the Worshipful Company of Fishmongers, in a romantic rendering of her wrapped in the dark blue cloak of the Order of the Garter. 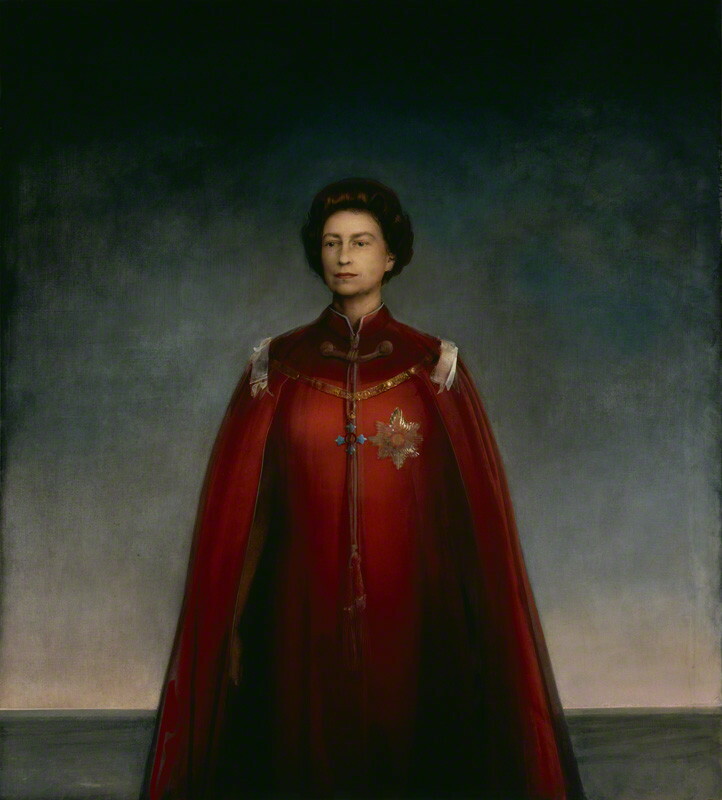 What I love about the study for the second portrait in red, is how the artist seems to have captured her strength and…well… her majesty so effortlessly. His concentration in the sketch is totally on her face. For the 1969 portrait Annigoni was granted 18 sitting over a period of eight months. The result of his first 8 sittings was this study in oil and pastel of the head and shoulders of Her Majesty against a dark night sky. 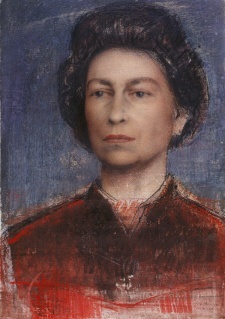 The final portrait can be seen at the National Portrait Gallery in London.